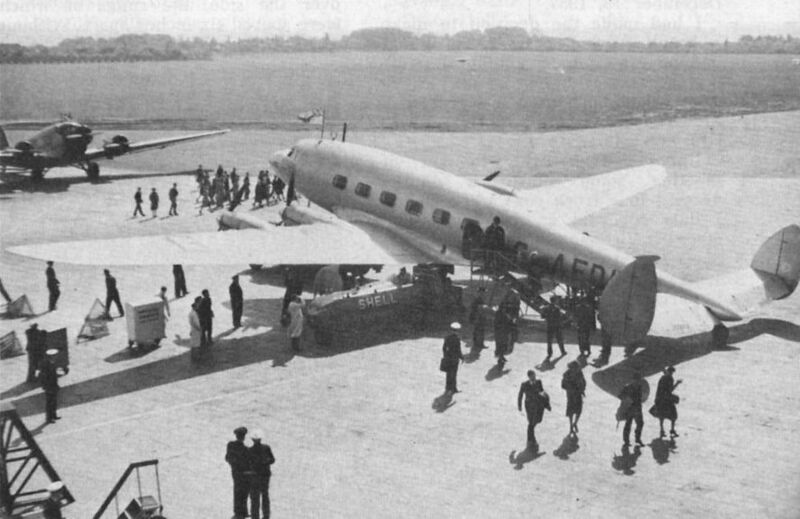 Danish Air Lines' Focke-Wulf Fw 200A-0 Condor OY-DAM Dania at Croydon in 1938. 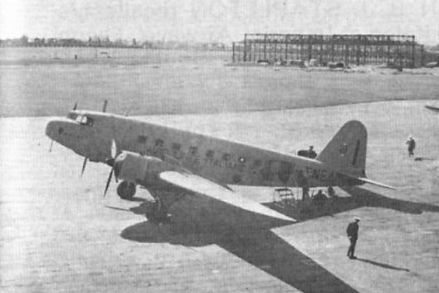 Danish Air Lines may well have been the first operators of the Condor when they put OY-DAM into service in July 1938. 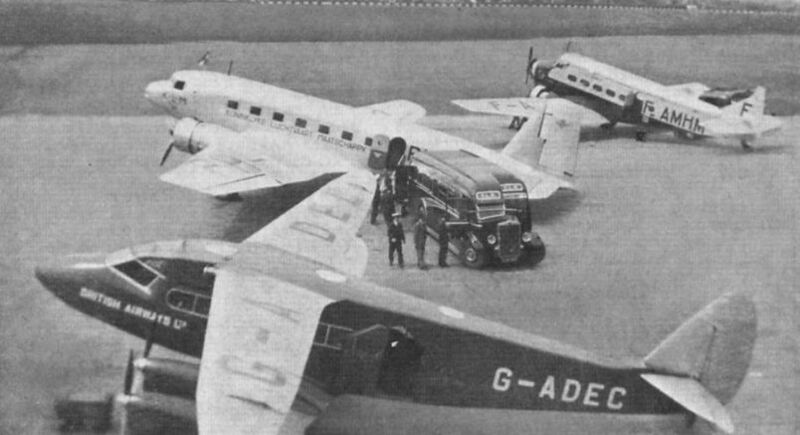 A line-up of four D.H.Dragon Rapides in North Eastern Airways' livery at Doncaster in 1938. G-ADWZ was later impressed into the RAF as X9449, and during a night-time Army co-operation flight it crashed at Llanrhaiadr-ym-Mochnant, N. Wales, on August 2, 1940. G-ADDE survived impressment as X9386 but failed to obtain a post-war C of A. G-AEXP, a D.H.89A, was impressed as X8505, damaged by enemy action at St Omer on May 25, 1940 and subsequently destroyed. G-AEMH was impressed as X9387 and survived many scrapes with the RAF to last until 1961, when it was scrapped at Ipswich. In 1936 a terminal was built at the Doncaster Municipal Airport with facilities to check-in up to 12 passengers at a time. KLM was a regular user of the airport, their DC-2s, mainstay of the European fleet, being regular visitors. 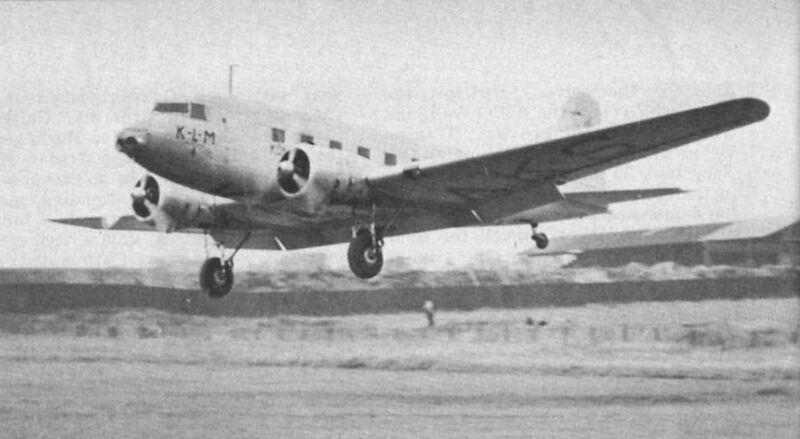 Photograph shows Douglas DC-2 PH-AKS Sperwer coming into Doncaster some time in 1938. Note the Doncaster Race course in the background. Avio Linee Italiane S.A.'s Fiat G.18V l-ENEA at Croydon in 1938. Very similar to the DC-2, the G.18 first flew in March 1935 and entered service with AVI the following year. Six G.18Vs were built, of which 'EA was the fourth, entering service in 1937. The fleet was based at Milan and operated the Venice-Milan-Turin-Paris service which was extended to London on June 1, 1938. 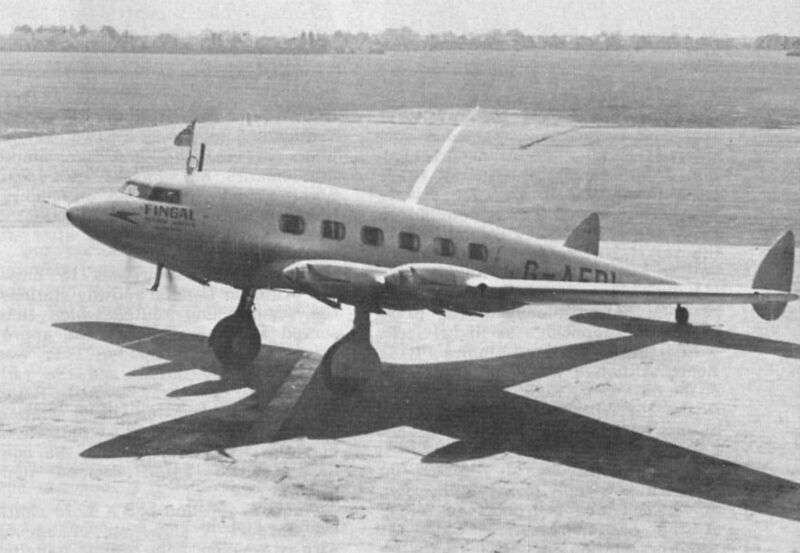 KLM introduced the Lockheed 14 to their European network in 1938. With the arrival of PH- APE Ekster at Doncaster it marked the first visit of an aircraft fitted with Fowler type area-increasing flaps. Ekster was not fitted with wing tip slots, and the type was prone to spectacular wing drops during round-out - it was this characteristic which led to Ekster’s loss on a training flight.